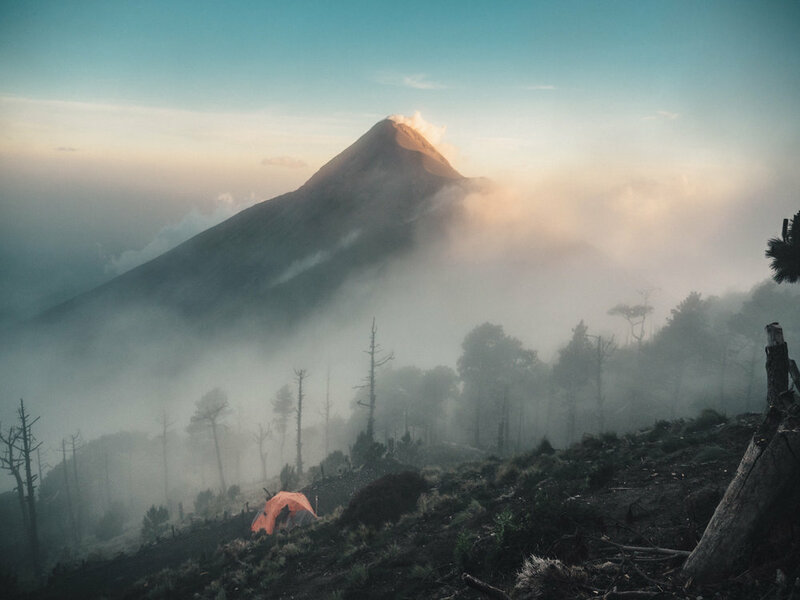 Central America is one of the most volcanic regions in the world, with a few of the biggest and most active in Guatemala. El Fuego is probably the most known, not only because of its recent outburst that reached the news worldwide. About a 100 people died and about 300 are still missing. Eruptions are nothing unusual for the people living down the mountain. It spits fire and ash daily, and sometimes every hour, mostly during the night. Usually it's nothing to worry about. The local communities and farmers are used to the threat and warnings and at some point ignored. This is what happens and on June 6 it went seriously wrong. El Fuego erupted like never before. It rained burning coals and pyroclastic cloud made its way down the valley. People panicked, got in their cars to evacuate but it was too late. The cloud took out the oxygen out of the which made engines fail to start. The terrifying images of the movie Dante’s Peak which I saw as a child came back to me while the hostel owner Antigua, the old colonial town nearby the volcanos, tells me the horrific stories. This is one side of the story. Others say locals got warned way too late, that the government neglected to reach out to late. Acatenango is the volcano just north from El Fuego. 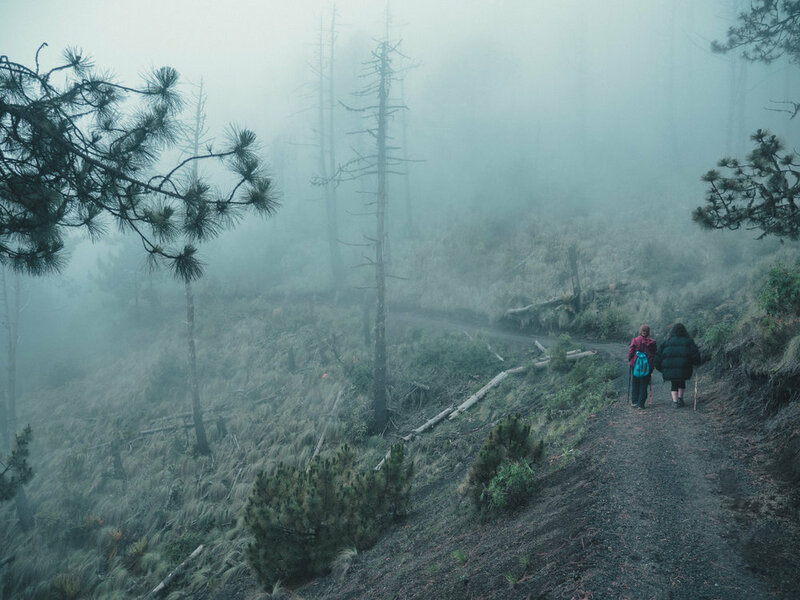 There is a long hike to the top which gives the best view on El Fuego just 2 km away. You can hire a guide for a day trip. 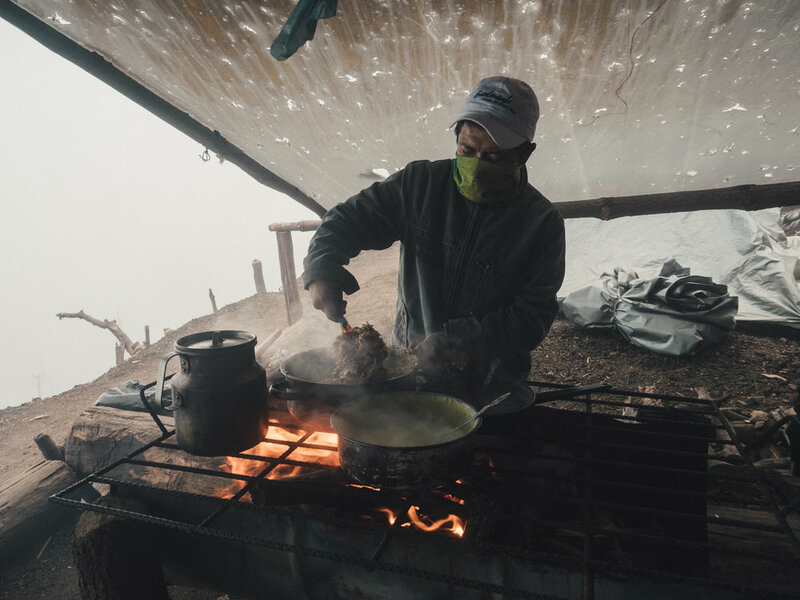 It’s a 5 hour walk, covering 4,5km and 1400m altitude gain to basecamp where you can spend the night. Than it’s another 2km and 300m up to the crater at 4000m. The guide picked me up from the hostel in Antigua. Two Israeli girls joined the tour. 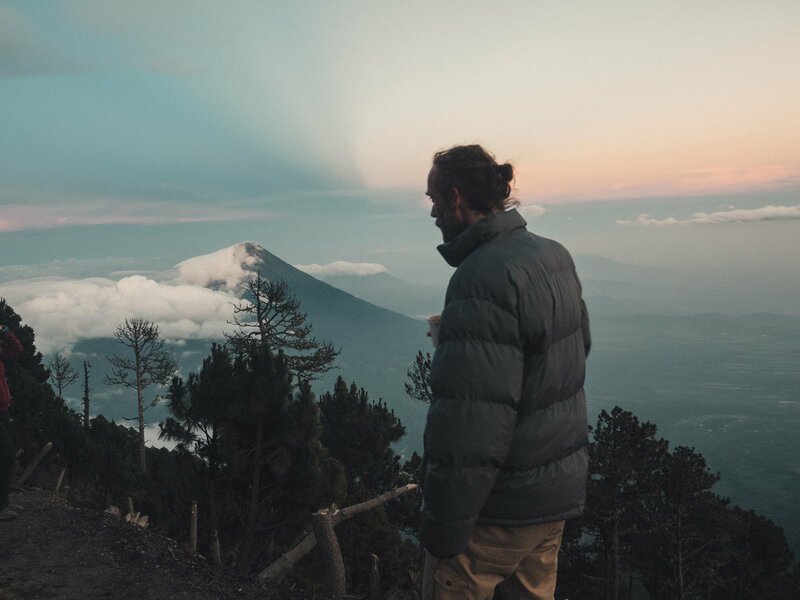 The hike is marked as moderate/difficult and is the hardest in Guatemala. I was a bit nervous in the morning, remembering the hike to Arco del Tiempo that gave me days of muscle pain. It was also going to be cold to sleep at 3700m. At the start of the hike we could rent warm jackets, gloves and hats. The hike went pretty well. It was steep in the beginning but the volcanic soil was smooth and easy to walk. One of the girls was a bit slower which made it easier for me, other then in Arco del Tiempo where I was alone with a guide who was really fast. It was sunny down at the trail head in the village, but the higher we climbed, the thicker the clouds. It was cold, one of the girls was shivering, not doing well. She had made a mistake by wearing a cotton t-shirt, which stays wet from sweat and doesn't dry up fast enough when it gets colder. For hours we didn’t see nothing but mist and dreary grey trees. We couldn't see further than 30 meters, basically there was no view. After 4,5 hours walking we reached the camp, where we would spend the night and rest, and hike the last part to the summit, early morning at dawn. Someone had prepared the camp for us. We warmed up around the fire and ate some food. Our hopes on a good view wasn’t very high. We hadn’t seen anything of El Fuego yet, no views nor sounds of volcanic activity. There was just a white wall of clouds in front of us, like we were trapped in a snow storm. We waited for a few hours until out of nowhere, the clouds vanished in seconds. Like a curtain that opened the view on the valley was revealed. 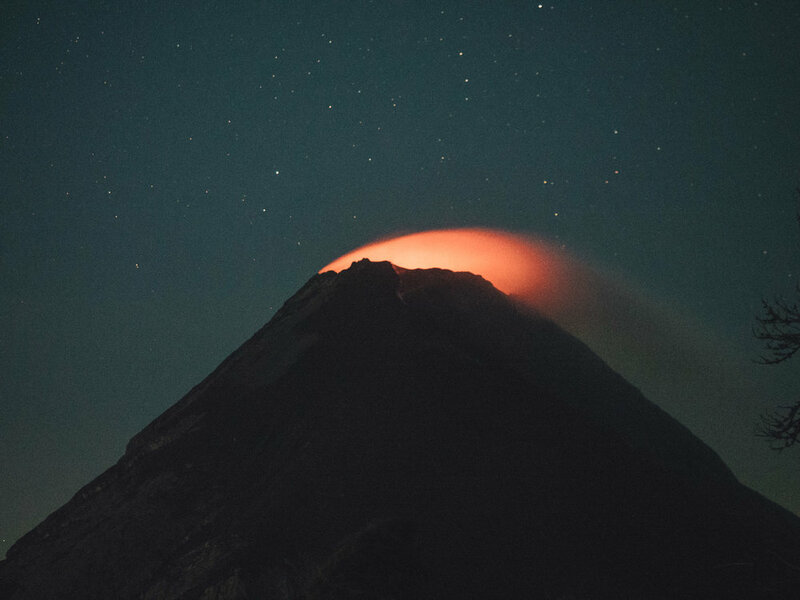 ‘Amigos, on your right, Volcan El Fuego!’ said the guide. An amazing moment. Sunset was near, and clouds kept drifting on by changing the view and the colours like a time lapse movie. The fact that we didn't see anything all day made it even more special. The guide cooked for us on the fire. Spaghetti, black beans and coffee. The tarp above him was full of holes of burning stones coming down from the eruption on June 6. He was up here, he tells us, and had burned his arm seeking shelter. Hikers had came down from the mountain with burned arms and shoulders. It must have been a terrifying moment. The girls went in the tent when it got dark at 7. I stayed up with the guide, keeping the fire burning. It was cold. I wish I had brought some tequila, and maybe my kindle. There was nothing else to do then to kill time staring in the flames. There wasn't much of a conversation because of the language barrier. At 10 I went into the tent. It was close to freezing now. From the other tents which are empty I took some extra mats and sleeping bags which made me sleep warmly. The guide would wake us up if there was any activity on El Fuego but the night went by quietly. We got up at 3am, had breakfast and started the hike up to the crater in the dark. One of the girls stayed at base camp, because she had fear of heights. While we walked up the volcanic sand got softer, which made the walk more difficult. It was hard not to slip. I used my tripod as a walking stick. Our headlights lit up the trail while slowly the horizon started to get blue. Lights were flickering of the towns in the valley. The historic city of Antigua, further away Guatemala City. In the distance the slopes of Volcano Pacaya, the most active volcano at this moment, coloured red. I kept an eye on El Fuego while we walked up, but it remained quiet. Near the top the wind got stronger. We pulled up our collars and raised our voices while talking at each other. There were other groups of hikers. Clouds swept over the edge of the volcano. The place was haunting, without any sign of life, other than the hikers. Only the soft volcanic soil and the sweeping, cold wind. We walked down the centre of the crater where there was a small, white cabin. A memorial plate told a story of scientist who had died on the mountain. 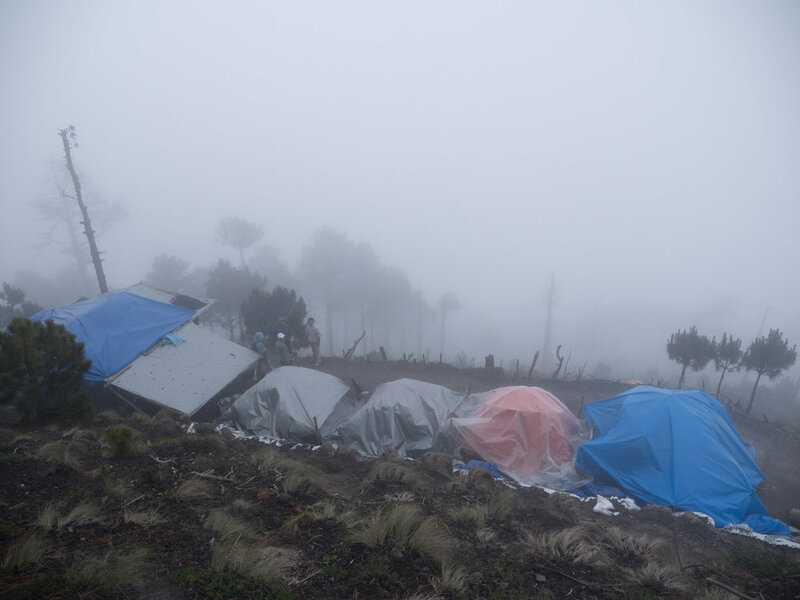 El Fuego was unexpectedly quiet for the entire night and morning. This was it, the highest point. We walked down, as the sun rose and warmed up our frozen toes. Maybe slightly disappointed to not have witnessed any activity El Fuego, but nature is sometimes unexpected. The views were worth the hike.